Invasive Impact: What’s the Status of Invasive Species in Alaska? NOAA Fisheries Jun 26, 2015. Fisheries are an economic and employment engine in Alaska, with the commercial and recreational sectors generating $4.8 billion in sales impacts and 61,000 jobs in 2012. However, invasive species, or species that are introduced to a new area where they have the potential to cause harm, could significantly affect the ecosystems that make Alaska so productive for fisheries. Fortunately, Alaska’s marine environment remains relatively pristine compared to other regions that have experienced massive invasions, but there is still much to learn to protect valuable fish habitat. Linda Shaw, from the NOAA Fisheries Alaska Regional Office, is working to study the potential impact of invasive species on fish habitat in Alaska. After obtaining her Master’s in Biology, Linda joined NOAA in 1990, and her work has focused on protected species and habitat conservation. While on a detail to NOAA’s headquarters in Washington DC, Linda learned about invasive species issues affecting the lower 48 states, including threats to biodiversity, natural resource economies, and human health. She’s now coordinates the Alaska Region’s efforts with NOAA and our partners to study and respond to invasive species in Alaska. The most harmful marine invasive species currently occurring in Alaska is Didemnum vexillium, a colonial tunicate, or sea squirt, found in Whiting Harbor, Sitka, during a community biological monitoring event held in 2010. D. vex likely arrived in Alaska from floating rafts used for mariculture from British Columbia. This species has already infested coastal New England and the fishing grounds of Georges Banks, smothering organisms growing on the bottom of the seafloor, an important habitat for groundfish. It has the potential to cause similar harm to Alaska’s seafloor ecosystem. I would say the next species of concern would be European green crab spreading north from British Columbia to Alaska through larval transport. They are voracious predators on native shellfish and crabs, including juvenile Dungeness crab. 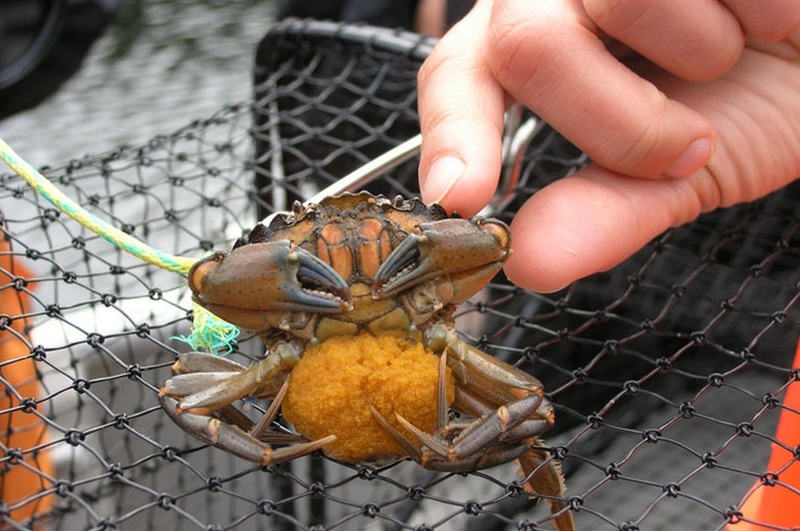 European green crabs thrive in estuarine environments, which serve as nurseries for commercial fish species. They also act as direct predators to shellfish being grown using aquaculture. Because Alaska has such a large marine area, there is also the possibility that there are invasive species in our waters that we don’t know about yet, such as the Asian copepod from Puget Sound. Species like the Asian copepod could be transported by the discharge of ballast water as ships travel between ports. D. vex smothers the seafloor by growing over other organisms, and possibly even produces toxins that inhibit the growth of other organisms. In Georges Banks it may prevent groundfish from feeding on benthic prey like worms. The Asian copepod in Puget Sound is a “sit and wait” predator that does not move in the water column, so it may not be as visible to fish as a prey item. Atlantic cordgrass creates beneficial marshes on the east coast, but on the west coast it fills in and uplifts mudflats, which normally serve as nursery areas for valuable species such as flatfishes. Alaska is relatively pristine and has not experienced many invasions compared to the lower 48, due to a more intact, diverse ecosystem and less time for human disturbance. The colder climate may also deter invasion by some species, but this resistance may be weakened by climate change. Many invasive species also display an amazing ability to adapt to new environments. The Alaska seafood industry accounts for half of all U.S. fisheries and has much to lose from disruptions to ecological productivity, so we should be aware of the potential for invasives to disrupt Alaska’s marine environment. Alaska is in a unique position compared to much of the world because there is still time to prevent invasions before they happen by disrupting the patterns of spread for various invasive species and monitoring for new infestations when they are still small and controllable. NOAA Fisheries partnered with the Alaska Department of Fish and Game, invasive experts from universities, and the community of Sitka to hold a “bioblitz” biological monitoring event in June, 2010. This event led to the discovery of Didemnum vexillum in Sitka, which was a bit of a surprise and should be a wake-up call that Alaska is susceptible to the spread of marine invasive species. To continue studying invasive species and their potential impact to Alaska’s fisheries and other living marine resources; including habitats that support them. Linda is a member of the NOAA West Coast Invasive Species Team and serves as NOAA’s representative of the Western Regional Panel on Aquatic Nuisance Species.